An article (subscription required) in Saturday’s Record-Searchlight makes it clear that there is still discussion about whether 2 lanes for auto traffic with the addition of a Better Bikeway would better serve downtown businesses and local families than the current configuration of three lanes for auto traffic only. This is a rare opportunity to improve the flow of movement in downtown Redding in the immediate future. It would be the first step to replacing the aging highway conditions in downtown Redding and building an urban avenue featuring better bikeways, greenways, and improved crosswalks. It would improve the movement and connections between the Westside neighborhoods (and important upcoming improvements there) and the Promenade and Pine Street areas. It would provide the opportunity for a Better Bikeway connecting the popular Sacramento River Trail to downtown businesses. This would keep bicycle travel out of the dangerous “door zone” and separated from auto traffic. It will make downtown walking safer and more convenient and improve the foot traffic that is essential for healthy businesses. It will calm traffic moving through downtown without causing congestion. It aligns to improvements that are planned in the longer term. It is the type of improvement called for in the current General Plan. Its a great opportunity to do more with less: Less cost to the taxpayer and bigger benefits to businesses and families. This is exactly the kind of real change that will boost the viability of downtown by helping make downtown Redding a place people want to be. We need you to email the Caltrans District 2 Public Information Office at d2pio@dot.ca.gov RIGHT NOW and tell them you support rightsizing California Street to two lanes and adding a buffered bikeway. Get your friends and family to email as well! We don’t have much time, Caltrans will be making their decision this Wednesday, May 28. Make no mistake – this improvement will not happen without strong public support. Caltrans and the City of Redding have been tremendous supporters of our cause and have been eager to listen to our suggestions; that’s why it’s absolutely critical that we show there is a demand for this kind of quality downtown boulevard and bicycling facility in Redding. This is our chance to make a huge difference in the walkability and bikeability of downtown Redding in the near term. We need your help! What might California Street look like? The potential restriping of California Street. Caltrans will be making a pavement overlay on California Street in downtown Redding this summer as part of $3 million dollar project. There is potential to rightsize California Street to two lanes and add a Better Bikeway with buffers along the bike lane—providing safer movement for all users of the roadway. Why should we rightsize the lanes on California Street? Road diets result in safer streets for motorists, pedestrians, and cyclists. Researchers have found that road diets can be expected to reduce overall crash frequency by anywhere from 19% to 43%, with the higher crash reductions occurring in small urban areas than in metropolitan areas. A recent rightsizing of a one-way NYC street from three lanes to two resulted in a reduction of the percentage of vehicles on the street breaking the speed limit from 74% to 20% and the percentage of cyclists riding on the sidewalk decreased from 46% to 3%. If California Street were rightsized, pedestrians would have one less lane of motor traffic to cross, motorists would be less prone to switch from lane to lane erratically, and there would be more room for cyclists. The difference a road diet will make in the street life of California Street is incalculable. Peak traffic might exist for 30 minutes a day for 5 days a week or less, but people move on these streets for 24 hours a day, 7 days a week. Won’t going from three lanes to two increase congestion? No. The FHA has determined that road diets do not cause congestion on roads that carry under 20,000 ADTS (Average Daily Trips). California Street carried an estimated 9,200 ADTS in 2012. That’s maybe 1/3 more than Parkview Avenue carried that year. Parkview Avenue recently rightsized to 1 lane in each direction—noticed any congestion on Parkview lately? Neither have we. Furthermore, the data shows automobile traffic for California Street has been trending downwards over recent years, reflecting the national trend for less driving overall. Shouldn’t we just leave the streets alone? They’ve been fine like this for a long time. No, they haven’t been fine. The streets are currently designed to move the maximum amount of traffic through downtown at a high amount of speed. This makes downtown more unpleasant and uncomfortable for pedestrians and bicyclists, and is bad for business. If we rightsized California Street, what would we do with all that space? Glad you asked! We’re like to see a buffered bikeway! After all, the City of Redding 2000-2020 General Plan has a stated goal of making it easier and safer for people to travel by bicycle, to be effected by “incorporat[ing] facilities suitable for bicycle use in the design of interchanges, intersections, and other street-improvement/maintenance projects. ” This type of Better Bikeway can easily be implemented within the limited scope of the current overlay project. NACTO (National Association of City Transportation Officials) defines a buffered bikeway as “conventional bicycle lanes paired with a designated buffer space separating the bicycle lane from the adjacent motor vehicle travel lane and/or parking lane.” Simply put, it’s a normal bike lane with a little extra space just like the image at the top of this post. Is a buffered bikeway on California Street a good idea? YES. Yes, yes, unequivocally, yes! Portland State University researchers found that customers who arrive by bike spend 24% more per month than those who arrive by car. Traveling by bike encourages more frequent stops than a car. In a study of Toronto merchants, patrons arriving by foot and bicycle visit the most often and spend the most money per month. New York City found that protected green lanes had a significant positive impact on local business strength. After the construction of a protected bike lane on 9th Avenue, local businesses saw a 49 percent increase in retail sales. In comparison, local businesses throughout Manhattan only saw a 3 percent increase in retail sales. Even drivers who never ride bikes themselves overwhelmingly report greater comfort around physically separated bike lanes. After Chicago’s Kinzie Street green lane was installed, a travel time study found little to no effect on automobile traffic: – Eastbound morning rush hour travel time from Milwaukee Avenue to Wells Street increased by less than one minute. – Westbound morning rush hour travel times from Wells Street to Milwaukee Avenue slightly improved. – Evening rush hour travel time in both directions slightly improved. After a green lane was installed on Chicago’s Kinzie Street: Bicycle ridership on increased 55 percent, according to morning rush hour counts; Forty-one percent of respondents changed their usual route to take advantage of the new protected green lane. NYC’s Prospect Park West protected green lane saw a 190 percent increase in weekday ridership, with 32 percent of those biking under age 12. 94% of respondents to a recent Shasta Living Streets survey agreed or strongly agreed that if there were better bicycle (like buffered or protected bike lanes) facilities and pedestrian facilities in town, they would ride their bicycle or walk more often. 93% of respondents to a recent Shasta Living Streets survey agreed or strongly agreed that a buffered or protected bike lane would make them feel more comfortable riding their bicycle on city streets. Nearly two-thirds (65%) of Americans who don’t bicycle say they would like to ride more often. Citations for these and many more statistics can be found at People for Bikes’ website. Why should my tax money be used on a bicycle lane? 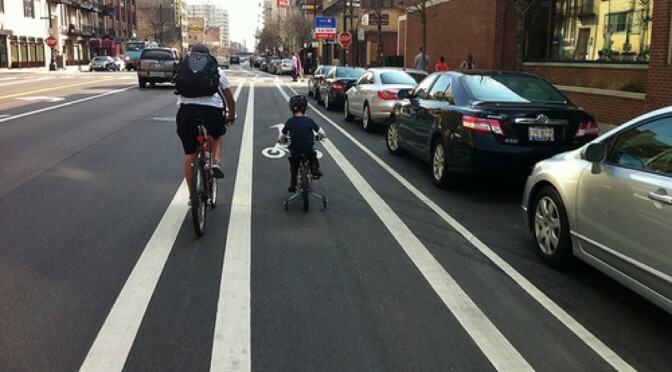 Most bicyclists also own a car and pay taxes and registration like everyone else. In 2008, Governor Schwarzenegger signed legislation that requires cities and counties, when updating the part of a local general plan that addresses roadways and traffic flows, to ensure that those plans account for the needs of all roadway users—not just motorists. More people on bicycles means less auto traffic for the remaining motorists on the road, and it reduces city costs for maintaining roads since bicycles do not cause the same wear and tear on road surfaces as heavier cars and trucks. Is this an ambitious enough proposal? This is just an overlay project and has a very limited budget and scope. A buffered bikeway can be put into place with just a few gallons of paint. Any more significant changes to downtown circulation would be more expensive and would have to wait for a future project. In this case, the perfect is the enemy of the good and we should applaud Caltrans and the City of Redding for attempting to do more with less!